Our interactive map of the UAE (United Arab Emirates) shows the location of all seven emirates; Abu Dhabi, Ajman, Dubai, Fujairah, Ras Al Khaimah, Sharjah, and Umm Al Quwain. Surrounding and nearby countries such as Bahrain, Iran, Oman, Qatar, and Saudi Arabia are also shown. Use the slider on the left to see the location of the UAE in relation to the rest of the world. The map offers two unique views – ‘Map’ shows a detailed road map, while ‘Satellite’ shows an aerial view. 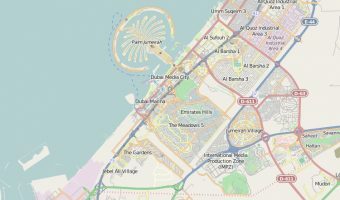 Google Street View is currently only available in Dubai. Drag the Google Pegman onto the map. Any roads where Street View is available will be highlighted in blue.